In July 1888, it was announced that the The A. J. Beatty & Sons glass factory of Steubenville, Ohio had been seeking a site for a new factory when in the summer of 1888 they announced that they would be moving to Tiffin, Ohio. In much the same way that municipalities compete for business relocations today with tax breaks and other incentives, the city of Tiffin offered both the land and cash and utility concessions to win the coveted contract for the new Beatty & Sons factory. Construction began on the new factory at the corner of Fourth Avenue and Vine Street in September, 1888, and work was completed on the new facility one year later in Auguest, 1889. During this time, the company mostly produced pressed glassware for largely mass consumption. In 1892, the U. S. Glass Company of Pittsburgh, Pennsylvania and A. J. Beatty & Sons merged, and Beatty's new Tiffin factory became part of a much larger organization of 20 other glassworks operating in various parts of the country. In fact, the Tiffin works were known within the new company simply as "Factory R" during these early years following the merger. 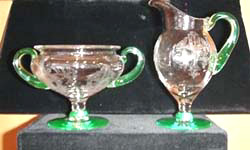 At the turn of the century, the public started to demand greater styling and quality than was the norm at the time in drab, colorless glassware and tableware, and the Tiffin operations were quite to spot the trend and began producing a broader line of more colorful yet affordable glassware which appealed to the new tastes. During this time, commercial production was still marketed and marked with a paper U. S. Glass Company label with the letters USG joined within a gold shield, but consumer goods as well as commercial producation after 1927 were marked with a gold paper label with the Tiffin name itself within the shield. Tiffin struggled during the years of the Depression, but they emerged from this period with a larger market potential in the aftermath of many failures during the years of the depression. In 1938, Tiffin became the dominant force within the U. S. Glass Company when the headquarters was transferred from Pittsburgh to Tiffin, and C. W. Carlson assumed the Presidency of the company. While the corporate name stayed U. S. Glass Company until 1962, all production by 1938 carried only the Tiffin label. 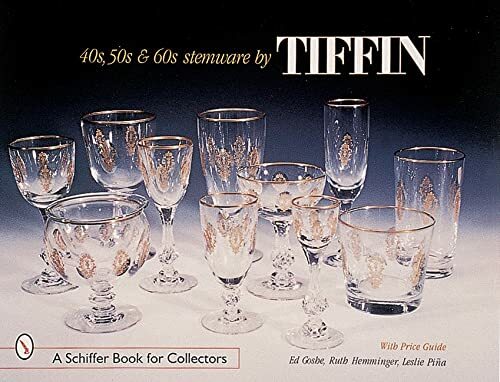 Following World War II, crystal stemware regained popularity in the U.S., and Tiffin was again in a good position to capitalize on the changing tastes. 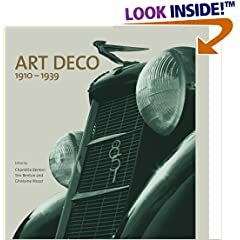 However, they also diversified into new areas and more modern designs, and in 1940 Carlson introduced the first of these which was known as the Swedish Modern line which had irregular shapes and a free-form design still very new to the public. In 1946, Swedish Modern was renamed Tiffin Modern to take advantage of the patriotism still permeating the country and to eliminate any confusion about its country of origin. In the mid 1950s, Tiffin purchased glass molds and equipment asssets from the Duncan & Miller Glass Company, and they expanded further by producing several popular Duncan & Miller styles. Nevertheless, the late 1950s were difficult years for the firm as they struggled with rapidly changing styles and cheap foreign imports, and the company was sold several times in an attempt at restructuring and survival. 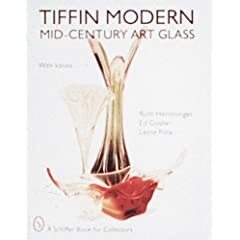 In 1963, four former employeeds banded together to buy the company out of bankruptcy from which it was trying to emerge as part of the Brilhart Plastics Corporation, and they renamed it the Tiffin Art Glass Company. Tiffin always had trouble achieving sales levels to operate profitably as an indepdent company, the the Continental Can Company purchased Tiffin in 1966 and renamed it once again Tiffin Glass Company, Inc. Tiffin was sold several more times before they finally ceased all production in 1980, but they continued through all the financial transactions to produce desirable stemware to match popular dinnerware and china patterns of the parent companies which included patterns Flambeau, Revelation, Jubilation, Canterbury, and Cabaret. They also produced private label glass and stemware for leading department stores including Tiffany & Co.,Macys, Nancy Prentiss, Sears Roebuck, and Montgomery Ward. Shortly before ceasing operations, Tiffin had been sold to Towle Silversmiths, but this too proved too little to keep the company in business. Today, many Tiffin patterns and techniques such as their parrot lamps and black satin glass are highly sought by glass collectors the world over. Buy period Tiffin, Fenton, Northwood, Carnival, and other finer glass & crystal on the Collectics Glass & Crystal and Fine Antiques pages, or search the entire site for great antiques, collectibles, and crafts for every collector!